In 1993, after making the choice to no longer record for traditional record companies, Michael took some time to find a new path. At Your House was his first release on his own reinstated label, Desert Rain Records. He had long played many solo acoustic performances and decided it was a good time to record something simple and acoustic. It became one of his most popular albums, in part, because of the intimacy of it. He opens up the disc with an invitation, "Hey, nice place you've got here! Mind if I play some tunes?" And then he breaks into a playlist of new and formerly released songs, all with a certain flavor that only the solo-acoustic version can capture. 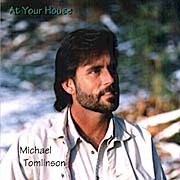 You feel like he's just walked into your living room and started singing for you, hence the album title; At Your House.